Did women use makeup in the nineteenth century? Men didn't think so. Ah, how naive. Because their women did use makeup but it was makeup designed to look natural as if the face were naked. 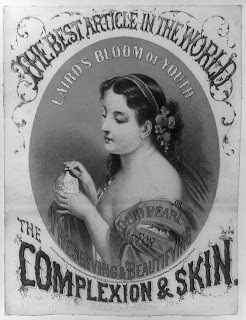 The skin was the focus of beauty. The paler the better, for pale skin denoted that the woman did not have to work outdoors and therefore was of a higher class. Besides bonnets and parasols to protect the skin from the sun, women used creams and lotions to lighten the skin tone. Many of these were home concoctions but commercial prepartions were widely available. There was a difference between skin-improving products and skin-masking products. The latter were considered skin "paint". Paints were associated with social climbers and momen who would trick men into marriage. A woman who painted her skin was engaging in a disreputable effort to use artifice to hide her social status. But there was a problem: many of the preparations contained highly toxic chemicals like arsenic, lead, zinc oxide, mercury, nitrates of silver and acids. Some women even ate chalk or drank iodine to achieve the desired effect. For references or additional reading, see the Extras tab.